Psalm 47:7-9 – For God is the King of all the earth; sing to him a psalm of praise. What does it mean for us that God is King? It should mean a lot to us. God is the King, and He is a good King. Not only is He our King, but He is also our Father, and that makes us part of the royal family. We are inheriting from Him much more than we can ever give back to Him. Sometimes we think that God can’t handle what we’ve got going on. Sometimes we thing it’s too big or too small for Him, but God is in the details. He is in charge of all things. Over all the nations, all the people, all the animals, all the cells and all the atoms. He’s got them all under His power. He can do anything. In Matthew 19:26 we read, “Jesus looked at them and said, “With man this is impossible, but with God all things are possible.”” If you want something big changed, you might contact your senator or your congressman. But what if you had access to the President. wouldn’t it be better to ask Him. We’re able to go right to the top, in fact we have Jesus interceding for us at all times (Romans 8:34 – Who then is the one who condemns? No one. Christ Jesus who died—more than that, who was raised to life—is at the right hand of God and is also interceding for us.) We are blessed to have a God who hears and listens to what is important to us. We can go right to the top and ask the one who can make all things possible. 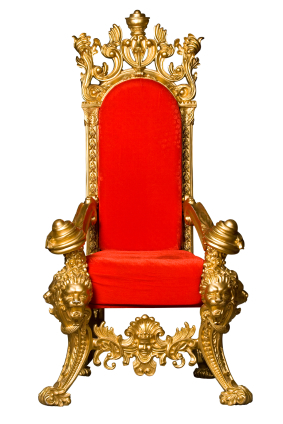 So why does it matter that God is seated on His holy throne? Have you ever seen a movie where the king enters to sit on His throne? Everyone stands and turns their attention to Him. Why? Because He’s about to get down to business. He’s ready to hear your requests, to give you advice, to celebrate with you, to send out His angels to protect you. To do all the God things He does. He has taken up His position of authority and is ready to use it. And because you are His adopted child through Christ Jesus, you’ve got an in with the Big Guy. You can have access to Him at any time. How amazingly blessed would you feel to be able to walk right up to the King? Right to His throne all the while knowing that He loves you as He loves His own Son. He took action for you and me that day. He had Jesus shed His blood so that you and I could live in Heaven with Him. He loves you that much. God is good! Do you want some time with the King?